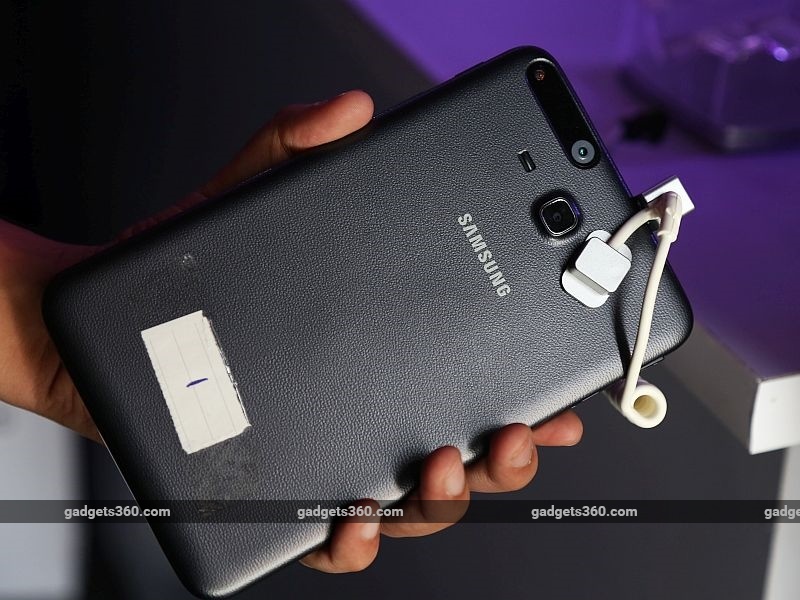 Samsung India on Wednesday unveiled the Galaxy Tab Iris in India. The new tablet from Samsung is another "Make for India" product though this is targeted at the enterprise segment as well as the government. The biggest highlight of the Samsung Galaxy Tab Iris is its iris recognition technology. It is the first device from Samsung featuring an iris scanner, which is included to support biometric authentication for services such as Aadhar, or Unique Identification Authority of India (UIDAI) authentication. At the launch event, Samsung stressed that the new tablet will offer cashless and paperless services to various sectors including banking and e-governance. Interestingly, the tablet won't be available in retail for consumers to buy. On being asked how the inbuilt biometric technology on the Galaxy Tab Iris will be an advantage to enterprise and government sectors, Sukesh Jain, Vice President, Samsung India, explained to Gadgets 360 that the Galaxy Tab Iris can enable a sector to streamline the process of authentication for various services such as banking, and also the process of government service enrolment for passport applications, taxation, and education. Talking about some usage scenarios, Jain added that the Galaxy Tab Iris eliminates the need for paperwork and can be used for citizen services such as government schemes such as pension disbursement; opening bank accounts and processing loans; insurance subscriptions and claim settlements; user ID verification, for telecom services, and more. Along with iris recognition, Samsung has made the Galaxy Tab Iris Aadhar-compliant and STQC-certified which means it can be used for UIDAI authentication right away. At the event, we got a chance to test the tablet's iris recognition for UIDAI authentication. The unit we used came preloaded with the Samsung Iris Aadhar app which requires the unique identification number linked to user's Aadhar cards to authenticate them. The app launched quickly, and after entering a 12-digit unique identification number, it performed an iris scan to authenticate the Aadhar card. The app took some time to scan our iris, but the overall process was easy. A Samsung representative at the event told us that the company may support different features leveraging iris recognition technology as well. Samsung will also offer software developer kits (SDKs) to its clients to develop Aadhar-compliant apps which will allow users to authenticate themselves with the iris scanner. The Galaxy Tab Iris tablet supports Samsung's Knox security features and also comes with Secure Boot, which the representative explained will protect the tablet from unauthorised rooting attacks. The 3G-enabled tablet also supports 14 Indian languages including Hindi, Tamil, Punjabi, Bengali, Gujarati, Kannada, Malayalam, Marathi, Sinhala, Assamese, Nepali, Telugu, Odia, and Urdu. Talking further about the iris scanner on the Galaxy Tab Iris, Jain stated that the device can carry out the e-KYC process out in seconds, instead of days as it usually takes. e-KYC is the process that allows companies to complete the regular KYC (Know Your Customer) process online with the direct authorisation of users. When asked why Samsung chose to support Aadhar authentication, Jain explained that it serves as an important database for many government-related projects such as DigiLocker, Pradhan Mantri Jan Dhan Yojana (PMJDY), National Health Mission (NHM), and other Digital India initiatives. Coming to the more ordinary features of the Galaxy Tab Iris, the tablet follows the regular Samsung Tab range design language, and there's nothing new or exciting about its looks. The front of the tablet is dominated by its 7-inch WSVGA (1024x600) display and there is no front camera. There is a physical home button placed between two capacitive navigation buttons. 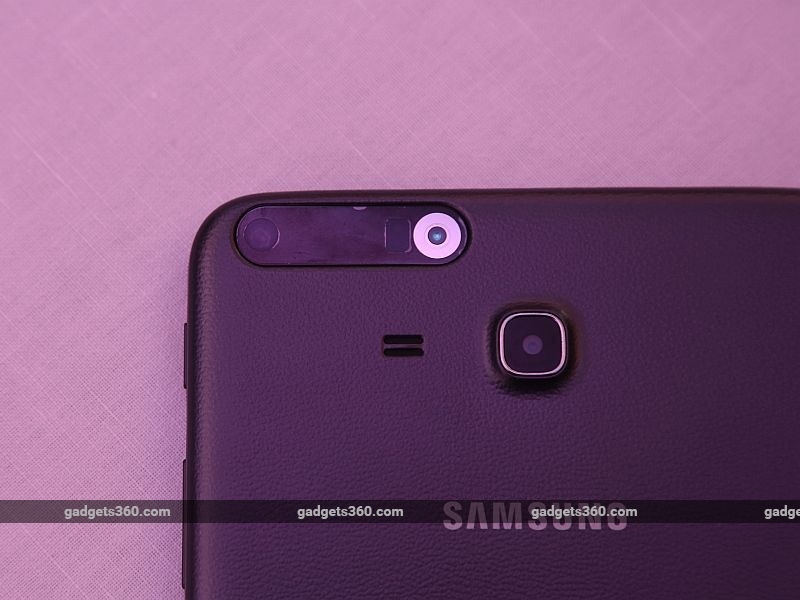 The rear packs the primary 5-megapixel camera and sports a leather-like texture. The iris-scanner has been placed at the back and is located in left corner of the device. The volume and power buttons are on the right, while the left houses the microSD card and SIM slots. At 327 grams, the tablet feels slightly heavy but it's not designed for daily personal usage, so that isn't a dealbreaker. Under the hood, the tablet is powered by a 1.2GHz quad-core processor with 1.5GB of RAM. There is 8GB of storage which is expandable via microSD card (up to 200GB). For connectivity, the tablet supports 3G, GPRS/EDGE, Wi-Fi 802.11 b/g/n, Bluetooth 4.1, and USB OTG. Measuring 193.4x116.4x9.7mm, it packs in a 3600mAh battery. Considering that the Samsung Galaxy Tab Iris is targeted at the enterprise and government sectors, it is hard to say whether it has competition of any sort. But the iris scanning technology definitely adds an extra layer of security to the overall authentication process that is required for all kinds of schemes from the government and even the private sector. The iris scanner could be a great addition to consumer mobile devices if Samsung decides to go down that path. The tablet has been priced at Rs. 13,499 but that is hardly relevant as enterprise and government buyers will most likely be buying it in bulk.